There's a thief amongst us! 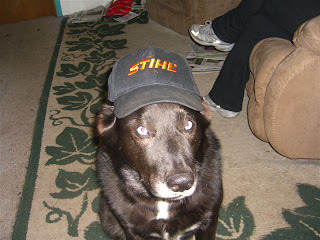 Sandy, our official meet and greet mascot has made many friends over the years here at Sandlake Country Inn. While not allowed in any guest areas, Sandy still is able to make many friends who look forward to seeing her each visit. Well, maybe not one couple who just left! After packing up their car to leave, they decided to take a little tour of the Cottage. When we got back into the parking area we noticed that their car door was open and laying on the ground outside the door was an empty restaurant food container on the ground. Our not so little "vacuum cleaner" who will eat anything found the leftover cake on the seat of their car and helped herself!! Hey, I guess she figures that anything in her reach is fair game. Fortunately, our guests had a great sense of humor about their loss. Don't worry, we'll give them some extra Sandlake Country Inn cookies on their next visit to make up for it. Mother's Day, May 11th is fast approaching. Think about giving that special Mother in your life one of our Sandlake Country Inn Gift Certificates. They make a great gift and what Mother wouldn't enjoy being pampered with breakfast delivered! This Mother's Day will be the first time in about 30 years I'll be able to spend with my Mother. Today we spent the afternoon with the moving truck, moving her near us. We found a lovely retirement community in Tillamook where the staff and residents have been so kind and are welcoming her with open arms. We know it's been a difficult transition, but are thankful to have her now living near us. Whatever you do for your Mother, remember to make her feel special! It's the last night of the OBBG (Oregon Bed and Breakfast Guild) conference and I'm ready to head home in the morning. We had a great Brewer's Dinner tonight at the Full Sail Brewery in Mt. Hood. Yes, even innkeepers can cut loose sometimes! This is also my last night at the Old Parkdale Inn which has a lovely view of Mt. Hood. Today the sun was shining and the Mt. was breathtaking. I enjoyed it much more than the snow we woke up to yesterday morning. Ron has been holding down the fort at the inn while I was away. What he doesn't know yet is that at the conference, I won a free night from a professional innsitter. Now we'll have to play a couple night getaway in the next couple of months. I was delighted to see a lovely couple who stayed with us a couple years ago who now own their own inn and are attending the conference. It's always great to see people go for their dreams. It's a lot of work, but nothing worthwhile is easy. Congratulations to them! Just last week Ron & I attended the PAII (Professional Association of Innkeepers International) annual conference for innkeepers. This year it was at the Disneyland Hotel in Anaheim, CA. Ok, so now you're not feeling sorry for us having to sit through all of those workshops! We did play "hookie" on Thursday and had fun meeting up with some old friends at Disney's California Adventure. Now I remember why Disneyland is for kids...we adults are totally exhausted by the end of the night. Both Ron and I woke up the next morning feeling like a truck hit us. But it was worth it. This is the first time we have spent any time back in Southern California since we moved from there in July of 2001. 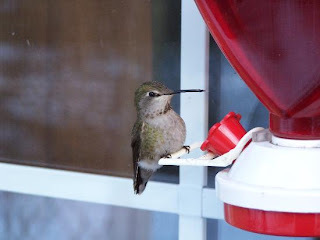 We loved reconnecting with friends, but let me tell you, we LOVE Oregon! After the first day there we felt like our senses were overloaded. Too many people, too many cars, too much noise, and sorry parents, but too many children! We love living on the Oregon Coast, but frankly, we really were missing some great ethnic food. We found a wonderful little Thai hole in the wall restaurant. Here's a word of warning...when you leave Oregon and go to an authentic Thai restaurant, medium spice is not what you're used to! Our next ethnic find was a Peruvian restaurant called Inca Anaheim. If you've never experienced Peruvian food, it's wonderful. It also reminded me of how much I want to travel to Peru. It's on my top 10 list of places I want to visit. 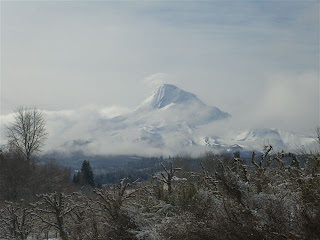 This week, Ron stays at the inn and I'm off to Hood River for the Oregon Bed and Breakfast Guild conference. 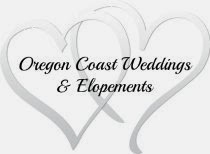 I'm really looking forward to meeting some of my favorite Oregon innkeepers and learn about what's new in Oregon innkeeping. Each year I can't wait to hear some of the amazing stories from Debbie Dersham of Eagle Rock Lodge. 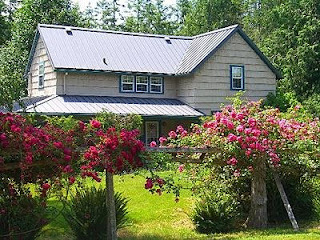 She and her husband Randy have a beautiful bed and breakfast right on the McKenzie River. Every summer they do an amazing amount of weddings on their property and after hearing all her stories it reminds me why we won't ever do weddings here at Sandlake! Maybe I'll be sharing some of those stories with you this week.